Kick off Memorial Day weekend with this fresh, delicious dessert! 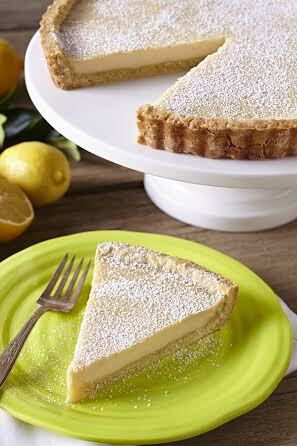 This lemon tart made using tofu is light, healthy and sure to be a crowd-pleaser! Spray a 9 inch tart pan with removable bottom with non stick spray. In a large bowl, whisk together the flour, sugar, salt, and vanilla bean seeds. Drizzle in the olive oil and stir it in with a wooden spoon, then drizzle in the water, and stir in together until lumpy. Use your hands and knead the dough until it just comes together as a ball in the bowl. Dust your work surface lightly with flour and dust a rolling pin. Roll out the dough 1 inch bigger than a 9- inch tart pan. Move the dough to the tart pan and press evenly into the pan. Prick the bottom with a fork and place in the fridge for 30 minutes to rest. Place chilled tart shell on a rimmed baking sheet and place in the oven to bake for 20 minutes. Meanwhile, add the tofu, sugar, lemon juice, flour, baking powder, and salt to the bowl of a food processor and blend until smooth. Remove tart dough from oven and carefully pour the filling into the shell. Place tart back into the oven and bake for 45 minutes, until just the center of the tart is still wiggly when gently shakened. Remove from oven and let cool completely. The filling will deflate slightly as it cools. Sprinkle lightly with confectioners’ sugar before serving, if desired. 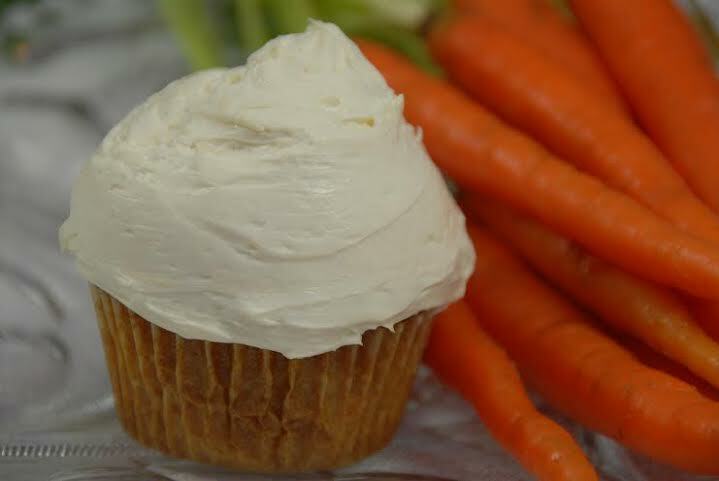 These fluffy and light cupcakes will be a hit with everyone – you won’t even miss the typical dairy cream cheese typically used on top of carrot cake! Preheat oven to 325°F. Line a standard 12-cup cupcake tin with paper baking cups. Peel the carrots and slice it into ½-inch chunks. Steam the carrot chunks for about 15 minutes, or until tender. Transfer the carrot chunks to a potato ricer and push them through into a small bowl. This will give you lumpless carrot puree. Mix together the coconut milk and apple cider vinegar in a 2-cup measuring cup. Whisk together the flour, baking powder, cinnamon, ginger, baking soda, guar gum, nutmeg, and salt in a large bowl. Make a well in the middle. Add the grapeseed oil, coconut nectar, vanilla and stevia to the flour mixture and stir to combine. Next add the coconut milk mixture and stir until it is absorbed and the batter is smooth. Stir in 1/3 cup of the carrot puree. Pour the batter into the measuring cup, as the spout will make it easier to pour the batter into the cupcake tin without spillage. Pour the batter into the prepared cupcake tin, dividing it evenly. Each cup should be about two-thirds full. Bake the cupcakes for 15 to 16 minutes, or until they are a light golden orange and bounce back slightly to the touch. Rotate the cupcake tin from front to back halfway through baking. Transfer the cupcake tin from the oven to a wire rack and let sit for 10 minutes before removing the cupcakes to cool completely. To make the vanilla bean cream cheese frosting, mix together the cream cheese and coconut milk in a medium-size bowl. Add the stevia and salt and stir until smooth and well incorporated. Stir in the vanilla bean seeds. Keep unfrosted cupcakes in an airtight container for up to 3 days, or wrap and freeze them for up to 3 months. Leftover frosting keeps in the fridge for about 4 weeks if stored in an airtight container. Makes 12 medium size cupcakes.